Your Internet Speed depends a lot more on your Computer’s DNS Settings. Switching your Default DNS to Google DNS will positively increase your bandwidth and you can browse faster than before. So, without any further ado, let’s have a look at some basic steps by which you can Change Default DNS to Google DNS. Domain Name System is a decentralized hierarchical naming system for a computer connected to the Internet. DNS mainly takes the domain name of websites from the users and convert it into their respective IP address. Computers only understand numbers 0’s and 1’s. When we enter the address www.google.com, the request is first sent to the DNS Server which converts this website URL to its respective IP address and asks your ISP (Internet Service Provider) to load those pages over the Internet. The default DNS on your Computer is generally provided by your Service Provider, which gives you comparatively less speed as compared with Google DNS. By switching to Google DNS, you can clearly improve the bandwidth of your Internet Connection. Why your ISP’s DNS is slower than Google DNS? ISP are into their own business of providing Internet Connection to a large number of Users. They just try to gorge as many DNS as possible but are unable to handle them properly. Whenever you try to browse any website, your ISP assigns you a dynamic IP address and lets you browse the web pages. This results in the decrease in the Connection Bandwidth. On the other hand, Google has their own data centers located in different parts of the world. When a request is received, it is handled via the closest data center available and re-route your Internet traffic to the nearest data center available. This results in higher bandwidth and faster downloads as compared with your Local ISP’s DNS. Step 1: In your Windows Computer, Open Control Panel/ Settings and click on Network and Internet Settings (Network and Sharing Center in Windows 7). Step 2: Browse through the different options available and under Change your Network Settings, click on Change Adapter Options. Step 3: A list of all the saved networks will appear. Right-click on the current network and click on Properties. Step 4: A new window shown below will appear. 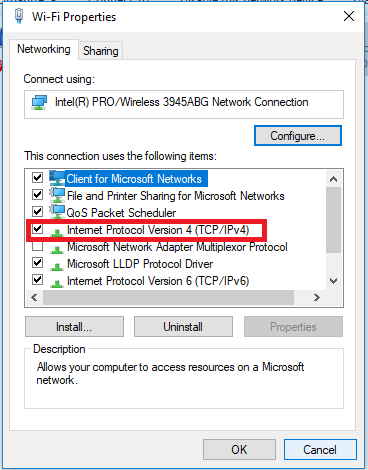 Select the TCP/IPV4 option (which basically allows your device to access resources on a Microsoft network) from the list and click on Properties. Step 5: In the new dialog Box, you can see the options to change the Domain Name Server and IP Address manually or you can Obtain the IP Address Automatically. Here, we have to manually change our Default DNS to Google DNS for improved bandwidth. 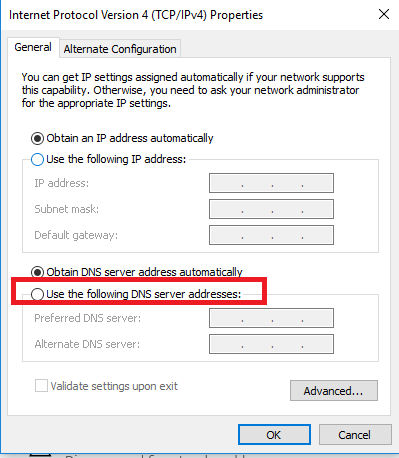 Step 6: Click on Use the following DNS Server address fill the details as shown below. 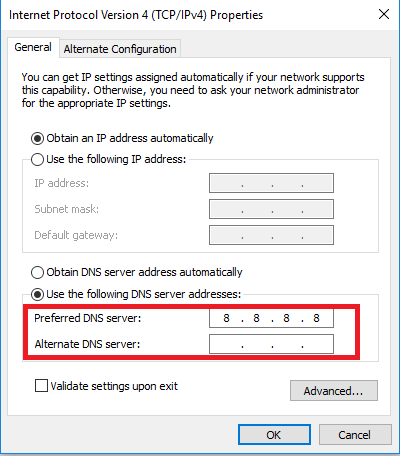 Change the Preferred DNS Server to 8.8.8.8. In the Alternate Server column, you can either leave it blank or change it to 8.8.4.4. Step 7: Apply these Settings and reconnect to your Network. Since, you have changed your default DNS to Google DNS, you will notice improved bandwidth and browsing speed after performing the above steps. We hope you were able to Change Default DNS to Google DNS on your Windows Computer. If not, then you may comment down below and our team will get it solved for you.